We have designed and worked on many residential projects where clients have their own studies and libraries. The study we are discussing here is in Melbourne. The design of the cabinet work has integrated a ‘secret door’. It could have been a simple everyday door, but it was far more interesting to create a concealed hided door. 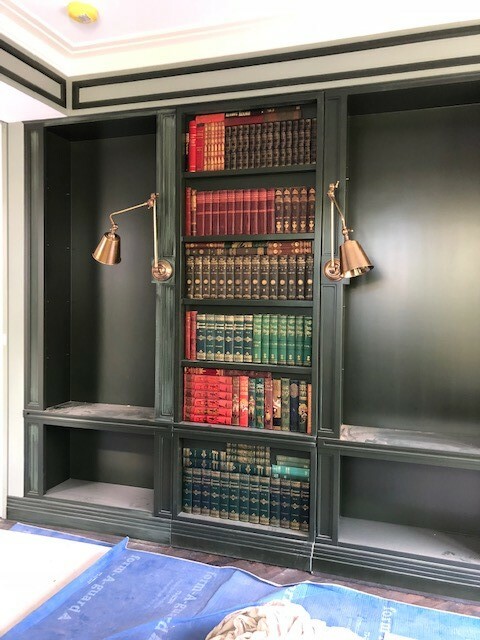 We used old book covers to create the illusion of book shelves filled with books. We took the covers of old encyclopaedias that were out of date, and books that were damaged and heading for land fill. It was a great way to recycle part of something that had no further use. When the door is closed it looks like continual book shelving running across the back wall of the room. With the touch of a concealed lock, you are able to enter into the room behind with the greatest of ease. We’ve all seen the Agatha Christie movies with secret doors in stalely homes that lead to mischief and mayhem. Well this is certainly different, nothing sinister going on here. What could have been just a plain doorway, is now an interesting architectural talking point that is both practical and unique. Newer PostLondon Blind a Perfect Choice. Older PostBeautiful and very Functional, Describes this Bathroom.